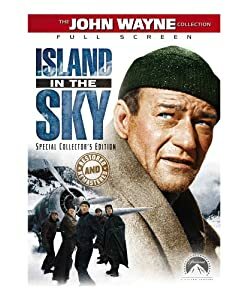 Island in the Sky is a John Wayne movie from 1953 which was out of circulation for over two decades due to rights problems, but which has now been released onto DVD and is available from Big W for just $5 (if you can find it!). I bought this on the recommendation of Leonard Maltin. John Wayne of course stars in this film, but here he is not the hero of the film and shows for a brief period that his acting range does extend beyond ‘macho’. He’s the pilot of an army transport plane forced down due to poor weather in the frozen waste lands of Canada. He and his crew try to survive the freezing cold, but the main focus of the film seems to be on the search for the plane by Wayne’s friends and colleagues. Uncharacteristically Wayne is not the hero and he even sheds a tear when one of his crew members dies. It makes a big and welcome change from Wayne’s usual movie persona. Much of the acting is quite over the top and hammy, but I did enjoy the film immensely. The cinematography was beautiful as were the shots of the planes in the air. The story was very engaging too.